The powerful Ni-MH batteries allow for 30 minutes of cordless trimming. So you are free from the hassles of wires and plug-points and can enjoy wireless charging whenever you need it. It is 100% waterproof and is thus suitable for in-shower use. The product can be used to perform versatile functionalities. There are three attachments for accurate shaving, trimming and styling. The extra wide shaver blade and flexible smart foil help in clean shaving. It is fully washable for easy cleaning. So you will face no trouble in maintaining it. It is suitable for daily use since it requires five minutes of charging for one trim and takes just 1 hr 30 min for full charging. You can pick up any style such as the goatee, stubble and clean shave using the product using the three attachments that are versatile and efficient in their work. You can shave with precision and detailing using this appliance. The extra wide shaver head with smart foil contours to your facial curves and allows you to get your desired look with just a few strokes! So you can get a better shaving experience with minimal effort. As evident from the name “Wet and Dry Shaver Styler and Beard Trimmer”, it is equally efficient for in-shower and out-of-shower operations. The twistable trimmer has both a wide side and a narrow side. So once you are done with the removal of the excess hairs or shortening of long and thick facial hair, you can go for the fine trimming part. It is designed in such a way that you can trim just up to the length you wish to. It is available to trim at 1.2mm, 2.8mm, 4.8 mm, and 6mm for beard trimming. It is adjustable to any voltage in the range of 100-240volt so that you can use it according to your requirements both home and abroad. It is reasonably priced at around £37. Some users have found it to be a better beard trimmer than an electric shaver for daily use. The shaving part takes a longer time than expected to work. It does not come with a stylish case for keeping it when not in use or carrying it somewhere. 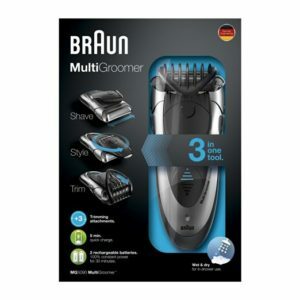 The Braun MG5090 Men’s Multi Groomer Wet and Dry Shaver Styler and Beard Trimmer is a versatile trimmer that can be used daily for a clean and précised shaving. Those who are okay with shaving for a comparatively longer duration and buying an extra case are suggested to buy this product to meet their requirements within their budget. The average rating for the MG5090 is 3.7 out of 5. There are not currently a large amount of reviews on this Braun so feel free to visit the page to see what you think.